You keep your property at a place ~ and when you return find it missing ~ immediate thinking in the mind is that of ‘property being stolen’…. ~ and will your thoughts be any different –if that property were to be a vehicle – a 4 wheeler at that !!! Indian roads are bad replete with holes and craters, big enough to receive a vehicle inside is the refrain that we hear quite often. Actually, the infrastructure [despite all the scams and cuts in contracts] is improving and there are some good roads – still one has to drive very carefully as you can encounter a jay walker, a casually darting two wheeler or wandering tractor or a heavy vehicle coming on the wrong side of the road. The roads are generally laid of tar / asphalt concrete – a composite material consisting of asphalt as a binder in layers and compacted do have big holes commonly called pothole. There is a similar sounding name in tamil ‘pothal’ which would also refer to a gaping hole especially on a surface. But the English word pothole is not a derivative from tamil. In some parts it is called kettle or a chuckhole – is a type of disruption in the surface of a roadway where a portion of the road material gives way leaving hole. Potholes basically are weak spots occurring over a period of time. They are mostly formed due to fatigue and develop in a pattern known as "alligator cracking". Then there is the ‘sink-hole’ – a shallow hole, a depression or hole in the ground caused by some form of collapse of the surface layer. Some are caused by chemical reaction, some by nature and some due to poor quality of components used … !!! Sinkholes may vary in size from 1 to 600 m (3.3 to 2,000 ft) both in diameter and depth, and vary in form from soil-lined bowls to bedrock-edged chasms. Sinkholes may be formed gradually or suddenly, and are found worldwide. Sinkholes may capture surface drainage from running or standing water, but may also form in high and dry places in certain locations. The formation of sinkholes involves natural processes of erosion or gradual removal of slightly soluble bedrock (such as limestone) by percolating water, the collapse of a cave roof, or a lowering of the water table. May be in movies, we see the ground caving in and taking in the villain and his group……….. in reality – not all those affected are bad … !! ~ and here is an interesting newsitem from dailymail on a sinkhold that swallowed a car. !! Ever had that sinking feeling when you open the front door in the morning and wonder where you left the car? Did you leave it on the road, park it in the garage... or has somebody stolen it? ……. The last thing you'd probably think of is that it might have been swallowed up by the ground. 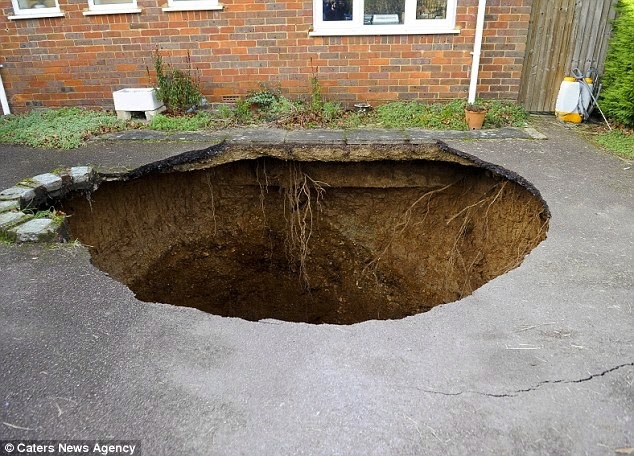 The story in Daily mail reads that a family has been evacuated from their home after a sinkhole opened up in their driveway and swallowed their car….. they woke up to discover their Volkswagen Lupo at the bottom of the 30ft hole which opened up on the driveway of their house in Walter's Ash, Buckinghamshire. The car was just identifiable through its muddy covering, lying at the bottom of the pit, which was 30ft deep and about 15ft across. Writing about mining in the area on a community website, a local historian explained: 'Earlier inhabitants of Naphill and Walters Ash made a living by digging on the Common and in the fields – digging for clay to make bricks, for chalk to make agricultural lime and for stone to shape as building and road making materials. It is thought the recent wet weather may have caused the hole to open up by eroding earth used to fill in the old pits. Now local building inspectors are assessing whether the property is secure. Mr Conran hopes it will be because there was no structural damage to the property which he believes was built on a concrete raft to safeguard against sinkholes. The Standard Fire and Special Perils Policy issued in India covers the perils of “Subsidence and Landslide including rockslide”. Sometimes, buildings caving in under their own weight possibly due to improper foundation are also sought to be claimed under this head. At every step Nature does good things to Mankind but also makes him realize quite often that when it unleashes its power, it could be too devastating.